Time Resolution Errors Uncovered Scientists implemented a novel technique to uncover time-resolution errors in complex weather and climate models. 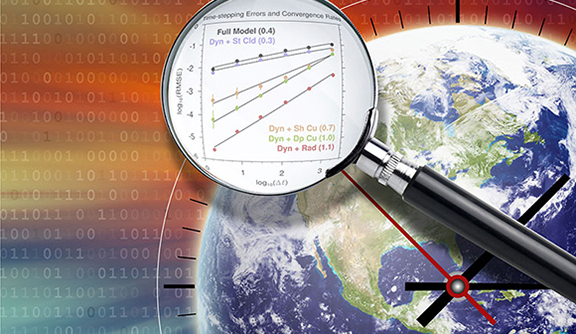 The resulting time step convergence test will help climate modelers identify the culprits that have triggered these errors and improve the fidelity and efficiency of the simulations. Enlarge Image. Results: Pinpointing the culprits responsible for errors in large-scale climate models can take a mathematical magnifier. To identify these transgressors, scientists at Pacific Northwest National Laboratory, Sandia National Laboratories, and University of Michigan developed a novel technique that efficiently measures and identifies time-resolution errors in the most complex weather and climate models. Applying the new method to the Community Atmosphere Model version 5 (CAM5) revealed that the primary source of time-resolution errors belongs to the calculations that represent stratiform clouds, those ubiquitous and dreary-day rain-makers. 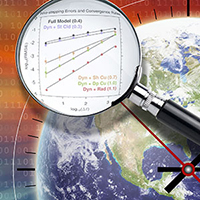 "Until now, the lack of effective methods to analyze the time resolution problem has prevented thorough investigation of this type of model sensitivity," said Dr. Hui Wan, atmospheric scientist at PNNL and lead author of the paper. "Our technique makes it possible to understand certain complex interactions between model components and identify the root cause of the numerical artifacts." Why It Matters: Today's computers can only represent weather and climate at finite, often large increments of time. Simplifications and judicious approximations are used as "stand-ins" to ease the burden on calculation time. But, compared to reality, these stand-ins are inevitably flawed, and sometimes how frequently the stand-in calculations take place makes a real difference in the accuracy of the results, a problem well known to climate modelers. Previous work has demonstrated that calculation frequency could change the model's estimated global-mean surface temperature increase caused by a doubling of carbon dioxide concentration by a factor of two, a scenario often tested by research looking at future climate possibilities. This study offers a simple and effective strategy—a time step convergence test—to identify the model components that are responsible for the missteps. Methods: With the new technique, a time step convergence test, the researchers conducted multiple, short simulations using CAM5 in which the model's calculation frequency was varied between the default value of 30 minutes to as short as 1 second. They diagnosed time-resolution errors against the simulation with the most frequent calculations. The same test was then repeated to evaluate various model components in isolation. The team identified major sources of time-integration error by comparing the absolute errors associated with different model components, as well as their dependence on the time-step length. What's Next? The research team will use the new convergence test as a major tool in their attempt to develop more accurate and efficient time integration methods for CAM. Sponsors: The Linus Pauling Distinguished Postdoctoral Fellowship and PNNL's Laboratory Directed Research and Development program; U.S. Department of Energy's (DOE's) Office of Science, Office of Biological and Environmental Research's Scientific Discovery through Advanced Computing (SciDAC) and Earth System Modeling programs. Facilities: Computing resources were provided by the Oak Ridge Leadership Computing Facility at the Oak Ridge National Laboratory through DOE's Advanced Scientific Computing Research Leadership Computing Challenge (ALCC) program.